The Circus is coming to town – Peter Frampton’s Guitar Circus featuring the Robert Cray Band that is. 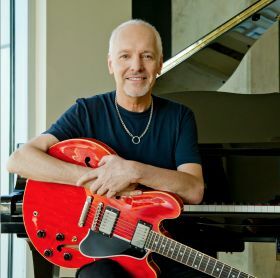 Guitar legend Peter Frampton will be bringing his Guitar Circus to Lancaster on Monday, June 24, and he’s enlisted the help of guitar greats Robert Cray and Roger McGuinn to join in the fun. Peter Frampton remains one of the most celebrated artists and guitarists in rock history. At 16, he was lead singer and guitarist for British teen band the Herd. At 18, he co-founded one of the first super groups, seminal rock act Humble Pie. His fifth solo album, the electrifying Frampton Comes Alive!, is one of the top-selling live records of all time. Blues guitarist and singer Robert Cray has won Grammy Awards for contemporary blues album and blues recordings. In January of 2013, Guitarist Magazine voted Cray’s “Nothin But Love” Album of the Year. Roger McGuinn, founder and lead guitarist of The Byrds, will be Peter’s special guest during the show and join him on stage for a few songs.